An increasing number of off-site construction projects utilising prefabricated timber solutions are now being attempted in regions outside of central and northern Europe. As these new developments appear, a variety of potential building case study projects present themselves, highlighting a range of regional issues that are unique to their situation such as the established prevalent building culture and knowledge base and the timber type and availability. One such example is the National Rental Affordability Scheme (NRAS) four-storey student housing project, situated on the University of Tasmania’s Inveresk campus in Australia’s most southern state. 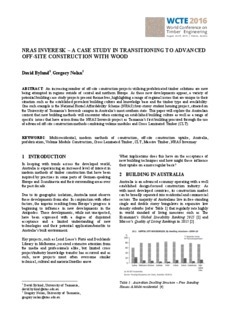 This paper will explore the Australian context that new building methods will encounter when entering an established building culture as well as a range of specific issues that have arisen from the NRAS Inveresk project as Tasmania’s first building procured through the use of advanced off-site construction methods combining volume modules and Cross Laminated Timber (CLT).